. But seriously, it doesn’t make any sense to buy a new modem and you won’t be able to use other SIM cards on it; at least you bought the modem with your hard earned money and you have control over your money.Right ? So, in this post I will be teaching you step by step how to easily unlock your ZTE MF190 Etisalat modem, but note that this tutorial will also work for other ZTE MF190 modems be it MTN, Glo, Airtel or what have we again so far it’s the ZTE MF 190type. 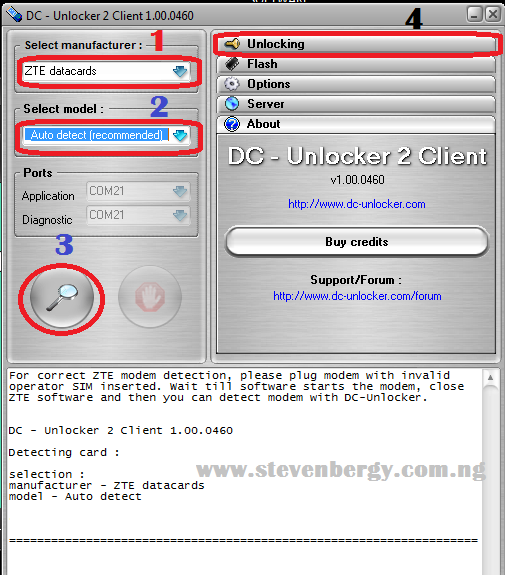 -> First of all, download The DC unlocker by clicking here if you don’t have before. -> Now, make sure you have removed everything in the modem including the SD card and SIM card in order to make the unlocking process easy and trouble-free. -> Now, insert another SIM card into the modem e.g. you can insert MTN, Glo or Airtel SIM card into it since we are trying to unlock a Etisalat modem and vice versa, hope you get ? -> You should now unzip the DC unlocker you downloaded in Step 1 (you can use winrar, winzip or any other unzipping app), then open dccrap.exe. -> After opening Dccrap.exe, you can now plug in your modem and wait for a while till the Computer reads and identify the modem. -> Now, choose ZTE data cards in the select manufacturer list (No. 1 in the screenshot). -> Choose Auto detect in the select model drop-down list (No. 2 in the screenshot). -> Don’t bother to touch the Ports list, just click on the search button (No. 3 in the screenshot). 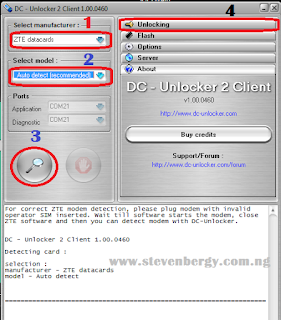 -> Now, you will see the DC unlocker is checking and testing your modem according to the text that is being displayed in the box below the options. -> When you’ve seen that the DC unlocker has detected your modem, you can now click on unlock under the unlocking options (No. 4 in the screenshot). In just few seconds, you will see a successful screen that tells you that your card/modem has been unlocked successfully. You are now through with your modem unlocking, now you can insert as many SIM cards as you want on your modem and you won’t see any restriction again which means that you now have power over your own modem. I am very sure you won’t have any problem while unlocking your modem because it is very simple & straightforward but if you face any problem, kindly make use of the comment box below - I'll be glad to help. Cheers !!! thank you bro.. it's works ..!! ZTE MF 190 with mobily KSA operator. and I'll try with STC card I confirm it's works. Thanks for dropping by Fatih, Glad to hear that it works for you. Thumbs up !!! Great bro, thanks a lot! My provider is too dumb to send me the correct unlock code, although all requirements have been met (one more reason to kick'em!). No I don't need them anymore, worked perfectly on a ZTE MF190. Thanks again, mate! Welcome Bro, Glad it worked for you. Thanks for dropping a comment and hope to see you again. Unwork for ZTE MF100 Etisalat. DC-Unlocker say that my modem SIM Card status is Unlocked but if in run the connection manager application, Connect Button is OFF (can not pressed). thanks. It worked for me. Now i can Use any Network. Pls. I tried to Unlock ZTE 190A (Etisalat) with IME 862591016973286, but it failed. Pls can u help me with the unlocker code. Brother, Dont mind the people saying bad about this software.... Honestly, IT ROCKS. JUST USED IT FOR AN UNLOCK. That's cool. Really glad it worked for you !!! You are welcome Jack. Thanks for dropping-by. You can do it yourself by following the tutorial. It can't be unlocked remotely !!! Thanks Mano, glad you like our Blog. Stay tuned as we deliver better to you next year. Cheers !!! Hello, where are you getting difficulty accessing the tutorial ? It's difficult to post all that as a reply here. Where are you not getting it ? God bless U....it unlocked my etisalat modem......but since dat operation, d modem has stopped to recognize etisalat sim cards,,,...but all other network suma are working fine....Pls help me Wot do i do??? Good to know it worked for you... Really ? I'm not sure why that is happening. Why not get a new etisalat SIM and try it with it ? It should work ! You should try it all over again, inserting the modem in another USB Port! HELLO, PLS HELP ME WITH MY ZTE MF65.. TRIED ALL THE STEPS BUT IT TELLS ME UNLOCK FAILED. Have you followed the procedures explained in this post?